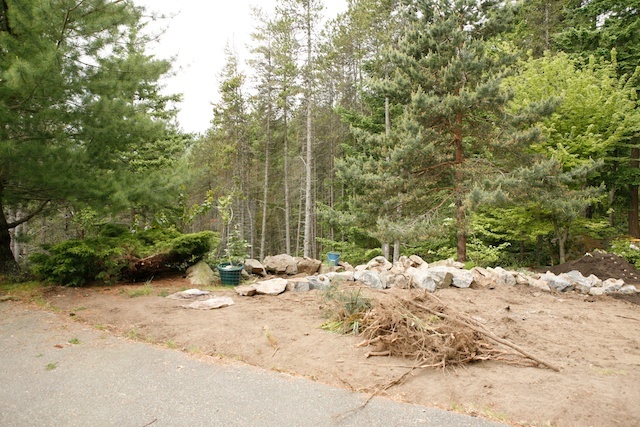 After much scraping and hauling and dumping of rock the ultimate form of the garden begins to take shape. Many houses here are perched, as it were, and in our case, the perchable rock resides at the terminus of a former logging road. Around the flat spot of rock where sits the house is a fairly sharp drop-off. 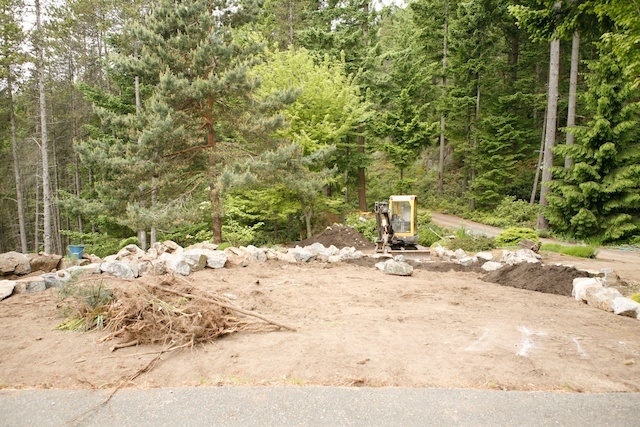 If one wants to make functional space of the drop off, one builds a retaining wall and hauls in fill — rubble, mostly, which gets topped with a small layer of dirt and in this case, some grass seed. The final effect is always pleasant — giving visual space and more often, a place to park the car! 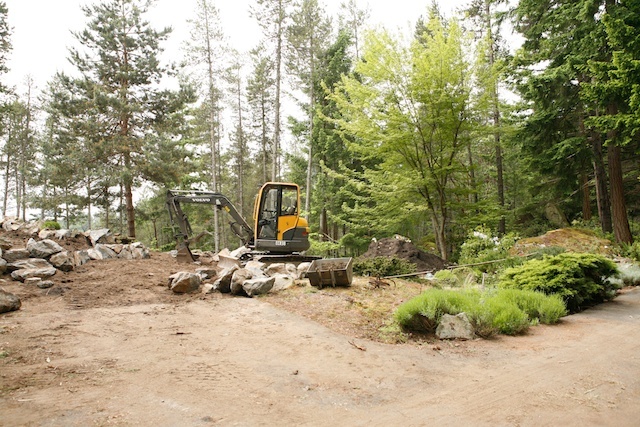 Subsequently, because of the substantial slope of the lawn, rock was hauled in to provide a wall to keep the soil from running off down the road to the Pacific. The new soil will be beautiful — weed-free, rich and fragrant — but will always need to be amended with compost to hold the moisture and give it nutrition — remembering there’s nothing below but rock. You can start to get a sense of the lines of the garden-to-be. 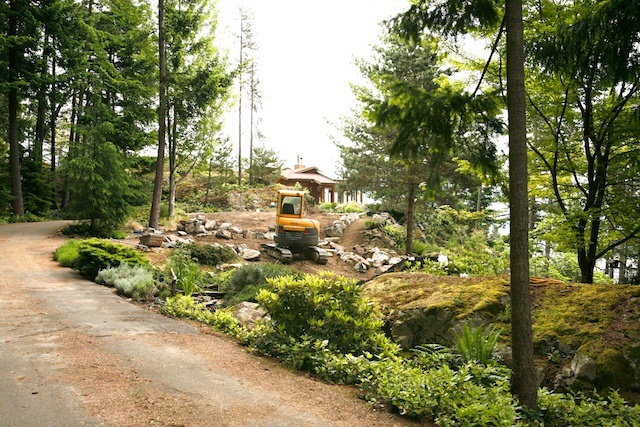 On the right side, a narrow path will travel between the original retaining wall and the new wall of the garden. Mid-garden, running horizontally in the picture, will be a narrow path walled by rock, creating a bit of a terraced effect. Three garden areas to be planned in total, all defined by stone borders, the borders holding the earth in place. This side view shows the central path and also that we’ve lopped out a few scrubby and unhealthy bushes and relocated the healthy ones. The intent is to bring more light into the garden. And the surprise, as I mentioned earlier, is a delightful view of a secret little bluff. I’ll get some images of that. I did learn something about transplanting big and small trees and bushes from Wynn that I think is worth passing on: When first transplanting, give the roots a good soak and then a good watering every three or four days. Meanwhile, give them a light foliar spray three or four times a day. With the foliar spray, take care not to add water to the root ball, just the leaves. We moved three full-grown and substantial trees, two cedar bushes, one forsythia and several lavender plants which all survived, did not droop, etc. Unusual for me! Next post: Playing in the mud. Wow what a change, looks like things are coming together quickly for you though. Do you have veggies growing on your deck in the meantime? A few veggies, waiting to be transplanted! I stared at the pictures for quite a while trying to sort out where the terraces would be. how many loads of earth? I believe it was three in total. A lot of dirt! L made a wonderful ziggurat at one end of the garden — I can’t seem to find a picture of it although I’m sure I did take one.